Interest among iPhone users in the upcoming HomePod speaker is greater than that of the Apple Watch prior to its launch, and more users are planning on buying Apple-produced speakers than Amazon Echo devices. Circulated by analyst firm Raymond James and first reported by CNBC, 14 percent of iPhone owners were planning on purchasing the HomePod. Also according to the firm, following announcement of the Apple Watch and before shipping the device, 7 percent of iPhone users were looking to buy the wearable. Raymond James also points out that combined with the 5 percent of iPhone owners actively looking to buy a Beats-branded speaker, that Apple tops the 16 percent looking to buy an Amazon Echo. 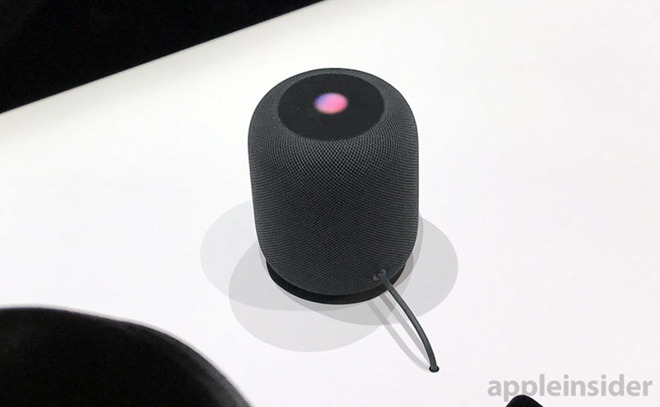 In June, a differently aimed survey showed that of 2200 adults, 33 percent said that they had interest in the HomePod. But, only 9 percent would probably purchase one, given the opportunity. Among Apple users, the purchase intent rose to 17 percent, similar to the analyst's note from Friday. Apple's HomePod was revealed at the 2017 WWDC. The HomePod is under 7 inches tall and wrapped in a 3D mesh acoustic fabric. In addition to the A8 chip that powers the device, it has 7 tweeters and a dynamic modeling subwoofer. Features of the device beyond music-focused Siri integration include realtime acoustic modeling, audio beam-forming, and multi-channel echo cancellation.